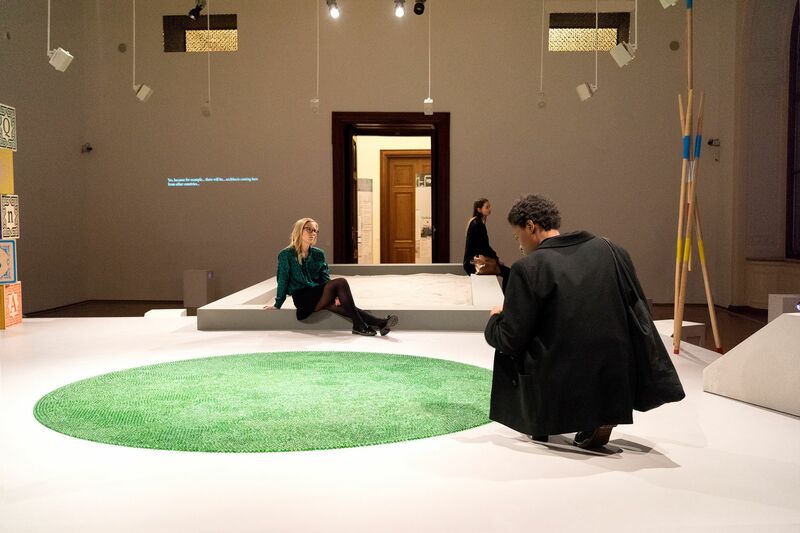 On the occasion of its reopening, the Weltmuseum Wien is delighted to present Dejan Kaludjerović’s latest large scale installation Conversations (2017). “Dejan Kaludjerović (born in Belgrade, Yugoslavia) makes drawings, paintings, installations and research-based projects. The installation Conversations is one such project, culminating as a kind of overview of multi-year research and production. Between the years 2013 and 2017, Kaludjerović interviewed children (6-10 years old) from different socioeconomic, cultural and ethnic backgrounds with a set of simple but provocative questions. Each set of interviews took place in the context of artist residencies that the artist held in Russia, Azerbaijan, Israel, Iran and his “home countries” of Austria and Serbia. These interviews were recorded then fused into recordings presented in exhibitions in each context, as sound installations. The interviews have been edited together in this exhibition, bringing all the material together as an overall analysis. Each prop that the artist made for each original context (sandbox, marbles, cubes, etc.) is also re-made and re-presented in this exhibition, presented together in an unsettling playground that stages some sort of invisible performance. Within a stream of often naïve responses, in these recordings appear from time to time curious absurdities, humorous outbursts, frightful musings, and absolute profundities as emited by these children. The entire work takes on the format of an unusual sociological research, apparently with no direct or pragmatic results. The viewer is left to himself / herself to make conclusions. However, the artist is certainly concerned with the origins of ideological, philosophical and political thinking as they manifest within various communities and cultures. This work presents these concerns within an apparent framework of childhood innocence, uneasily re-orienting familiar symbols and dialogue into a grander mirror of collective thinking. A full-color catalogue Conversations in English will accompany the exhibition featuring original essays by Ilya Budraitskis, Seamus Kealy, Jelena Petrović and Mohammad Salemy, together with short texts by Anastasia Blokhina, Zoran Erić, Beral Madra and Maayan Sheleff. The book will be published by VERLAG FÜR MODERNE KUNST, designed by Monika Lang. Dejan Kaludjerović has graduated from Belgrade Academy of Fine Arts. He lives and works in Vienna.